Home › Design News › KiCad 5 is out, And We Love It! KiCad reached another milestone in July 2018 – with the official release of a new version of the ever popular open source electronics and PCB design tool. KiCad 4 was released in December 2015 and almost 3 years later, and after many incremental updates, KiCad 5 has been released to the masses. Some of the changes include a new 3D Viewer, the ability to directly import Eagle projects and a slightly revised UI, all welcome changes. Eeschema (schematic designer) has been updated to include a few handy new features. The footprint wizard has been updated to allow for more package types to be created, there is also now a highlight net tool allowing you to see all of your connections with one click which is handy! 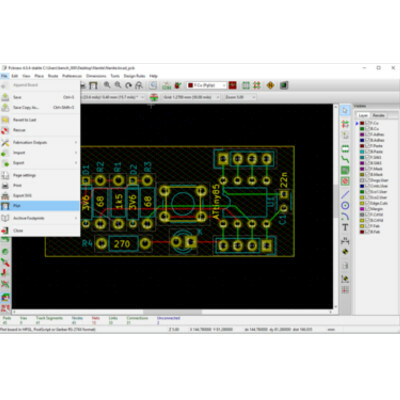 Throughout KiCad, libraries have become easier to manage and create and the experience is smoother than ever, making it further an enjoyable piece of software to use. Tech people are moving from other PCB design tools such as Eagle to KiCad daily and it’s easy to see why, most if not all of the functionality of the other options but it’s completely open source. Now Eagle projects are importable to KiCad it justifies the swap even more! And as well as more hobbyists starting to use the tools, so the user base of professionals continues to grow, with its many advanced features such as it’s push and shove router which rivals high end professional packages, led by resource investment by organisations such as CERN. Here at Milliamp we fully support open-source software and technologies, and our PCB design tool of choice (but not limited to) if our customers have no preference is KiCad and we would highly recommend it !